Morteza Khatib, a University of Miami researcher, shows off three rebar samples. The ones at left and in the center are made with glass fibers. The one on the right is steel rebar, and Khatib says it's unused but has been corroded by moisture in the air. When construction is complete, the Halls River Bridge in Homosassa, near Tampa, will include components made with glass-based rebar and SEACON. Seyedmorteza Khatibmasjedi has a conflicted relationship with concrete. Morteza Khatib, a Ph.D student at the University of Miami, shows off a photo of the Fate Bridge on the university's Coral Gables campus. The bridge is built with glass-based rebar. "I was always thinking concrete is the best material in the world," says the University of Miami civil engineering Ph.D student. (He goes by Morteza Khatib.) "All those skyscrapers, all those high bridges -- all of them are made out of concrete." "We make a kind of soupy material," Khatib says. "After 10 hours... it can hold two cars." But, he says, "I was working on concrete without paying attention to the environmental impacts." Concrete's strength and versatility make it a highly desirable building material. Khatib says there's roughly enough manufactured each year for every single person on the planet to get a three-foot-tall cube and still have about a billion cubes left over. Industry analysts routinely describe it as the second- most widely used material in the world, ranking only behind water. And water is part of concrete's problem. "It has to be basically the water that people can drink," Khatib says, adding that based on a 2004 Columbia University study, concrete production uses 180 billion gallons of freshwater per year. He says that water could be going to people who are suffering from water shortages. The structures and materials lab on UM's campus where research on concrete and glass-based rebar takes place. The ingredient list for concrete is short: sand, water, cement and coarse aggregate (which is basically rock). Builders like the simplicity of these materials, but collecting and preparing them for concrete can do serious environmental damage. Superheating limestone to make cement burns fossil fuels and can release pollutants into the air, (although UCLA researchers have figured out a way to make cement production carbon-neutral). Mining rivers for sand can interfere with freshwater supplies and damage fragile ecosystems. And then there’s the massive amount of freshwater required for the concrete mixture. Many concrete structures are constructed around steel rebar, and salt in the concrete could cause the steel to corrode. So the water used in conventional concrete has to be fresh, says Steve Nolan, a structures and designs engineer for the Florida Department of Transportation. He compares rebar corrosion to the rusting that occurs if you leave a paperclip in saltwater. That’s why builders haven’t historically been able to use seawater when they make concrete. They can’t use recycled concrete because it could be contaminated by seawater or — in some parts of the country — the salt that’s put on roads. And they have to wash sand with freshwater before they can mix it in. Khatib says each ton of concrete uses 18 gallons of freshwater to make. Columbia University researchers report the concrete industry makes more than 10 billion tons of concrete per year. So each year, the world uses more than 180 billion gallons of freshwater — enough to fill more than 272,000 Olympic-sized swimming pools — to make concrete. That doesn’t include the freshwater used to wash the sand. Simultaneously, 783 million people worldwide lack access to clean drinking water, according to the United Nations. Because of the corrosion issue, concrete made from recycled materials and seawater wouldn’t work with normal steel rebar. So the researchers are also testing a new kind of rebar, made primarily of glass fibers. Francisco De Caso with one of the freeze-thaw chambers, which the researchers use to test the rebar's durability. Khatib and Francisco De Caso, an associate UM scientist, show off their work in a structures and materials lab on the university’s Coral Gables campus. Hefting a piece of glass-based rebar in one hand and traditional steel rebar in the other, Khatib explains how glass rebar is lighter and stronger than steel rebar. Because glass rebar is not susceptible to corrosion from salt, they say it shouldn’t have to be repaired or replaced as often as steel. They’re testing that in a room that’s kind of like a time machine: They put the glass rebar into saltwater-filled chambers or they freeze and thaw it every day for a year. “One year in this room is equal to 50 years to 100 years outside,” Khatib says. De Caso adds, "At different temperatures, you basically accelerate the aging of the materials. Otherwise we'd need to wait 100 years, and I don't think I'd be around for that." 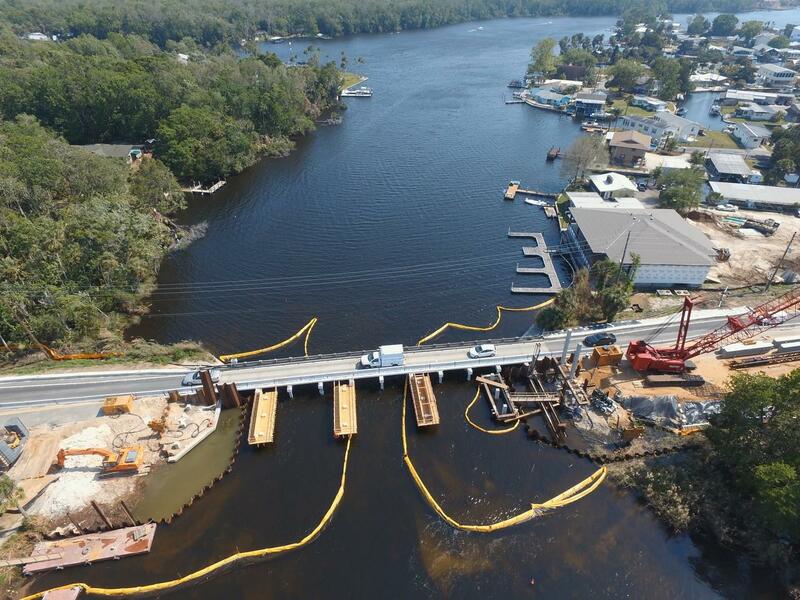 That's one reason SEACON’s project manager at UM, Dr. Antonio Nanni, reached out to Steve Nolan and the Florida Department of Transportation to use SEACON and glass rebar to build the new Halls River Bridge in Homosassa on Florida’s west coast. It’s still kind of an experiment: Nolan says instead of using west coast saltwater for the concrete, builders are trucking in saltwater from Miami to make sure the amount of salt is consistent with what UM tested. FDOT isn’t using SEACON for the bridge deck, where the cars drive, because the department wanted more safety testing first. And the glass rebar costs more than steel to install -- by as much as 15 percent. 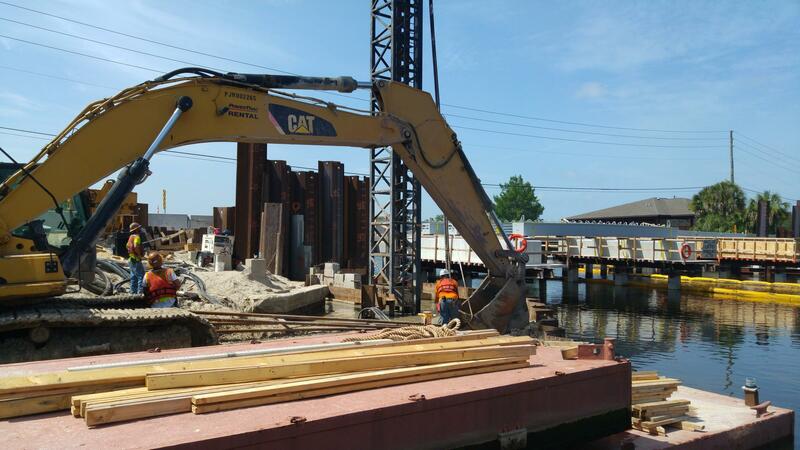 Construction of the Halls River Bridge is well underway and will include SEACON and the glass-based rebar. But, Nolan says, FDOT is willing to pay more up front if it means avoiding expensive restoration projects in 30 or 50 years. And he says he’s excited that concrete structures built with glass-based rebar might be more resilient to rising seas. SEACON, on the other hand, may become a victim of its own success. “SEACON is basically a surrogate for long-term durability testing. We get what are perceived as the ‘problematic components’ directly into the concrete,” Nolan explains. What SEACON has shown, he says, is that with the right rebar, it’s OK if there’s salt in concrete structures. Construction on the Halls River Bridge is expected to be complete by April 2018, says Steve Nolan of the Florida Department of Transportation. Nanni, the researcher who’s managing the project at UM, says that’s OK. The Halls River Bridge in Homosassa is up for an international award at a composite materials exposition in Orlando in September. The bridge is expected to be completed in April. A photo caption in this story has been corrected: The Fate Bridge at the University of Miami was built with glass-based rebar, but not concrete made with seawater. It uses conventional concrete. A meeting between Miami-Dade County officials and county residents concerned about aerial mosquito spraying was cancelled Monday.